Anyone familiar with artist Laurie Swim’s work, will appreciate the skill and attention-to-detail that imbue every scene she creates in quilt work. Hope and Survival is no exception. In 2000, Laurie Swim read Janet Kitz’s Shattered City. This started her research of material for a huge memorial quilt for the 100th anniversary of the explosion. Over the next 14 years, Laurie researched and thought about the explosion while working on other projects. The resulting work commemorates the event and honours those killed and injured. One story stood out for Laurie: the account of Barbara Orr, who lost all of her immediate family in the explosion. This young girl flew a quarter of a mile in the air. She was saved by landing on Fort Needham hill. In remembrance, Barbara donated the bells that are now part of the memorial of Fort Needham. 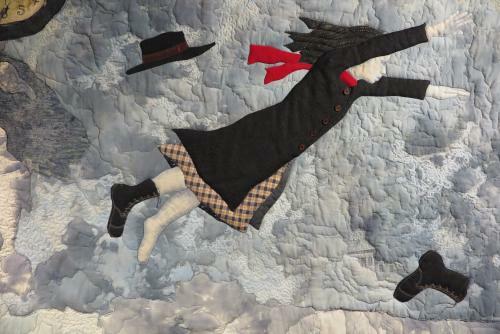 The image of the girl flying through the air became the focus of the center of the quilt. 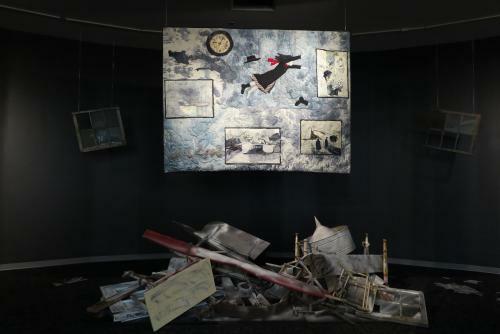 Other images and scenes in the centerpiece are depictions of what took place during and after the explosion. A map shows the geography of Halifax Harbour with Bedford Basin at the one end, where convoys gathered to make the trip overseas. The Narrows, where the collision took place, is also shown, along with the grid of the area called Richmond, the neighbourhood that was wiped out. 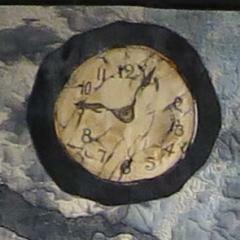 The clock, stopped by the blast, tells the time when the explosion happened. 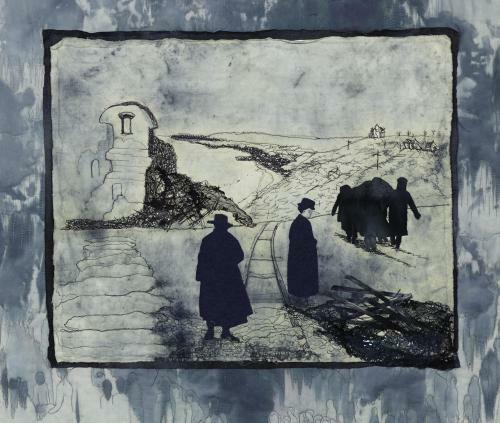 The indigo blue of this work refers to the scars people were left with when carbon-saturated, black, oily rain coated them after the explosion. The fabric in the quilt was created using snow in the dye process to symbolize the horrendous snowstorm that followed the day after the explosion, greatly hampering rescue efforts. One of 15 Braille “windows” featured as part of the Scroll of Remembrance. 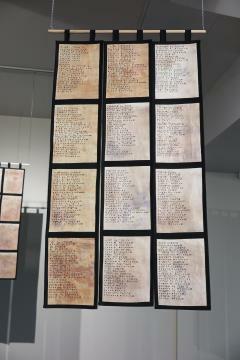 The Scroll of Remembrance is a memorial to 1,946 people who died in the Explosion and could be named. When Laurie designed Hope and Survival, she knew Braille would be a strong component in the work due to the many eye injuries that occurred. Translating the names of victims into Braille led to the collaboration with volunteers from across Nova Scotia and the Maritimes in beading the dots.